For the past 34 years, I’ve attended Calvary Episcopal Church in downtown Memphis. I grew up a Baptist PK (preacher’s kid), and I’ll always consider myself a Baptist. But for 34 years now, I’ve been a Baptist in residence at Calvary, an historic downtown church at the corner of Second and Adams. Now I could tell you that I started attending Calvary Episcopal Church because I chose to embrace Anglican theology. But if I said that, I would be bearing false witness, since I haven’t the foggiest idea what Anglican theology is. And if given a choice between hearing a sermon by Billy Graham or a sermon by the Archbishop of Canterbury, I’d pick Billy Graham every time. You can take the boy out of the Baptist church, but you can’t take the Baptist church out of the boy. I could tell you that I joined Calvary Episcopal Church because I like the Episcopal liturgy. But the truth is that I find all the kneeling, standing, lean-to-the-left, lean-to-the-right, stand-up, sit-down, fight-fight-fight as exhausting as a theological triathlon. No, the truth is that my church choice was not a matter of theology or liturgy. It all came down to the waffles. That and the fish pudding and the Boston cream pie. For over 80 years, Calvary Episcopal Church has celebrated the season of Lent by serving daily lunches in the downstairs Mural Room at the church. It’s called the “Waffle Shop,” and it’s held in conjunction with the Calvary Lenten Preaching Series that each year brings some of America’s greatest preachers to downtown Memphis for lunchtime services. If you attend the sermon, you get priority seating for the waffles. The first time I ever set foot in Calvary Episcopal Church, I thought I was going to an International House of Pancakes. It was 34 years ago in the winter of 1980. I was a young lawyer working for the firm of Thomason, Crawford & Hendrix in the 100 North Main Building, just across the street from the church. Roy Hendrix came by my tiny office late one morning and asked me if I would like to join him for lunch. And, of course, when a senior partner asks a young lawyer if he would like to join him for lunch, there is only one answer. Yes, sir. Yes, sir. Three bags full! But instead of going inside the sanctuary, Roy and I walked down a flight of stairs, and faster than you could say five loaves and two fishes, I was right smack dab in the middle of a feast. But I was as clueless as a Baptist in a casino. “Why this is the Waffle Shop, son!” responded Roy, with his best condescending you’ve-got-a-lot-to-learn-kid voice. Roy and I were seated at a long table alongside scores of downtown Memphis “bidnessmen.” My boss seemed to know everybody there, and he graciously introduced me to several downtown movers and shakers. A very nice lady then handed me a menu, and being the ambitious young man that I was, I knew exactly what I had to do. I was going to order whatever Roy ordered. Dress for success. Eat for success. To my dismay, Roy ordered something called “fish pudding.” It sounded absolutely awful, a veritable gastrointestinal oxymoron. But I had it, and it was delicious. For dessert, Roy ordered the Boston cream pie, and so, in a blatant effort to advance my career, I ordered the Boston cream pie. I ate every morsel of that wonderful dessert, and then, when my senior partner wasn’t looking, I licked the plate. I quickly learned that the Calvary Waffle Shop was open every day during the season of Lent. Being Baptist I had no idea what Lent was. I thought it was that white stuff that old lawyers sometimes get on their suits. 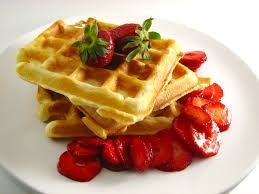 But whatever Lent was, I decided right then and there that in the spirit of ecumenical nutrition, I intended to support it by eating at the Waffle Shop every day. It was only years later after I was confirmed in the Episcopal Church that I learned that Lent is actually a season for sacrifice and self-denial. Based on my first visit to the Waffle Shop, I thought it was a time to stuff yourself silly, and I regarded it as a real blessing. And so, brothers and sisters, that’s how I became a Baptist in residence at Calvary Episcopal Church in downtown Memphis. The women of Calvary fed me waffles, fish pudding, and Boston cream pie on weekdays, and before you knew it, I was lining up for Communion on Sunday mornings. The Lord works in mysterious ways. Well, brothers and sisters, I bring you good tidings of great joy. From now until Holy Week, the Calvary Waffle Shop is open for business. At high noon you can hear powerful preaching in the church sanctuary and then you can head down to the Mural Room for a fabulous lunch. It’s one stop shopping. Feed your soul and then your stomach. Faith, hope and waffles. As is written in Matthew, Chapter 4, man does not live by bread alone. He should also have the fish pudding. And the Boston cream pie. csh: wonderful testimony and strawberries are a great idea. Eyleen: Yep. I actually had 2 meals at the Waffle Shop yesterday! Paul: May need to do a Memphis pilgramage! roy: I had the waffles today and they were wonderful. I also heard Tony Campolo preach, and that was even better! Peggy: Oh yeah! I'm a good ole Presbyterian and enjoy the Episcopal church feeding my body and soul every year during Lent. Love your blog, "Eddie!"